A fractal pattern is carefully transferred to a sheet of sterling silver, then cut out and finished by hand. Each brooch varies slightly. 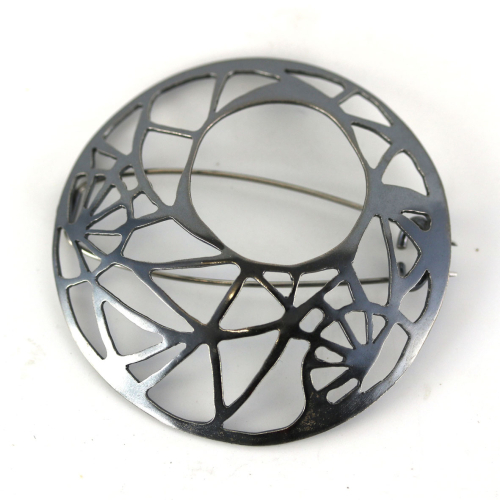 The brooch is approximately 5 cm in diameter and is fastened by a stainless steel double pin. The brooch is hallmarked at the Sheffield Assay Office. 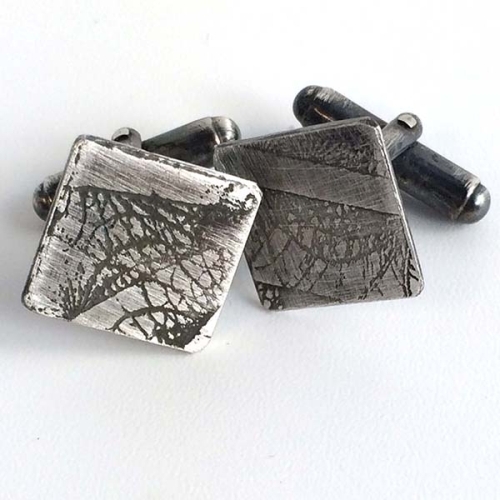 Hand-forged sterling silver cuff links with fractal image (each piece is one of a kind - the actual fractal image will differ from this photograph). The cuff links have a swivel fastener. 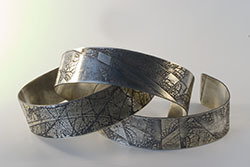 A delicate fractal pattern is carefully etched into a sterling silver strip and then formed into a 9-panel bracelet. Each panel is linked to the next with hand-cut sterling silver rings. The bracelet is hallmarked at the Sheffield Assay Office. 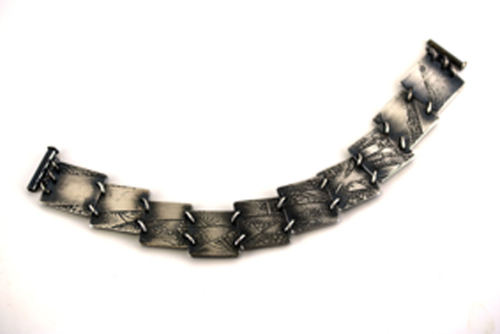 Each bracelet is approximately 8" long and has an easy to fasten tube clasp. Sterling silver etched locket. 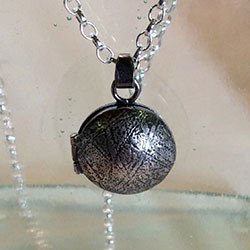 The locket is hinged together and fastened with a catch. Hallmarked. Necklace lengths can be made to order. 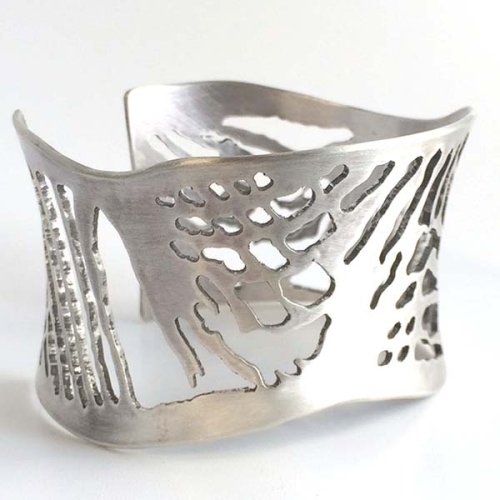 A flowing fractal net has been hand-cut into heavy sterling silver, which is then forged into a dramatic cuff bracelet. The bracelet is 6" diameter and approximately 1.5" wide. Each bracelet is hallmarked at the Sheffield Assay Office. Other sizes can be made to order. 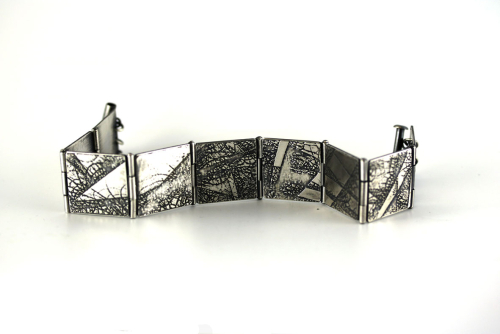 A delicate fractal pattern is carefully etched into a strip of sterling silver, which is then formed into a 9-panel bracelet. The panels are hinged together by hand and the bracelet has an easy to fasten tube catch. Each bracelet is hallmarked at the Sheffield Assay Office. Length 8". Other lengths can be made to order. 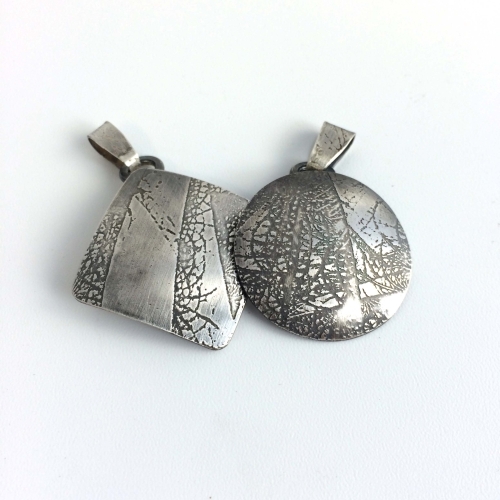 A delicate fractal pattern has been carefully etched into sterling silver and then hand-forged into simple and elegant earrings. 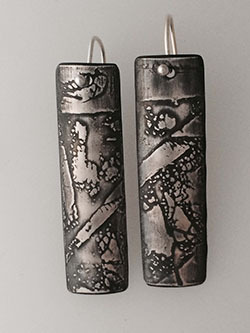 The earrings are 4 cm long and 1 cm wide. 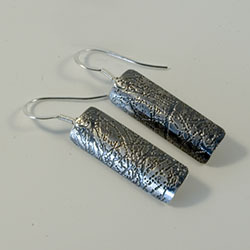 Because of the way that the silver is etched, each pair of earrings differs slightly. Hand-forged sterling silver pendant with fractal image (each pendant is one of a kind - the actual fractal image will differ from this photograph). 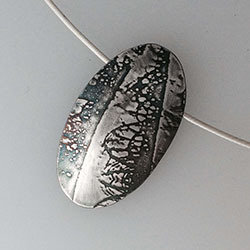 The pendant comes on a sterling silver cable 18" necklet with an S-hook fastener. 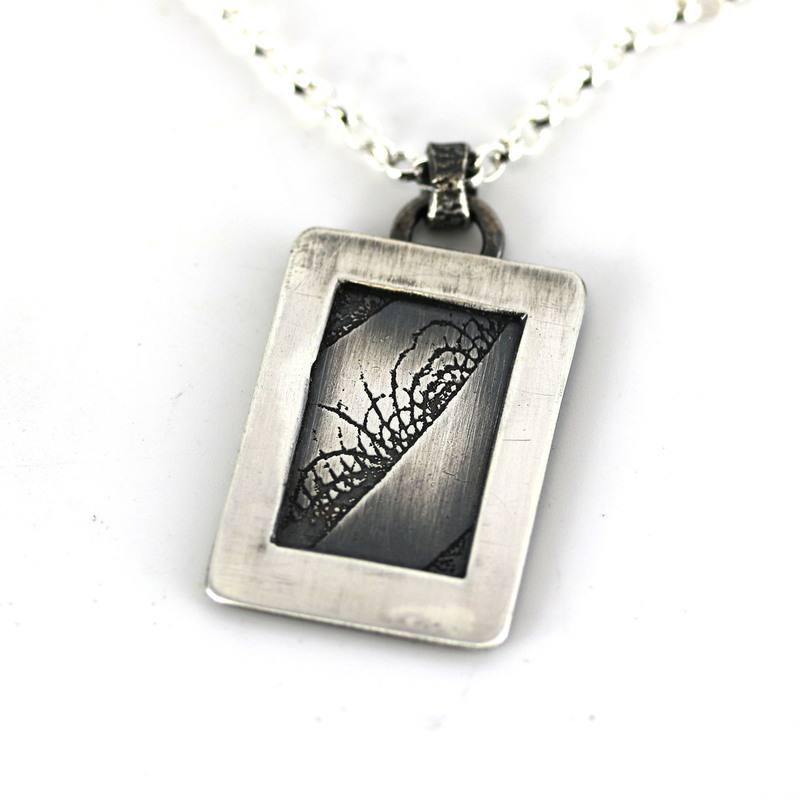 Hand-forged sterling silver pendant with fractal image (each pendant is one of a kind - the actual fractal image will differ from this photograph). The pendant comes on a sterling silver 24" chain with a hand-forged S-hook fastener.